Once in a while a book comes along that addresses the exact challenge that you have most faced with your child. And you get really excited about it. As you turn the pages, you are eager to see what unfolds, how the challenge is met and if it is indeed overcome. You hope that it is, so you can get some ideas from it, and perhaps it might just make an impression on your young one too. This is exactly how I felt when I started reading the Brave Brave Mouse. I often think of Winkie as a slightly reticent child, who is not always the first person in the crowd to try out new things, and often shies away from a new experience. There is a lot of fear factor in him and as a parent, I always mull over how to help him get over it. The one thing I keep emphasising to him is that if he isn't willing to try out something new, he will never know how much fun it can be. Sometimes it works and he ends up having a grand time after all, and sometimes he just sticks to his guns. Now, I don't know how much of an impression this particular book made on him on the whole, and whether he could relate himself to the main character...but it certainly stayed on my mind and made me want to review it here. The story is that of a little mouse who is not very brave. In fact, he is afraid of a lot of things and some situations simply fill him with fear. For instance, he is afraid of shadows and the silence of an empty room. He is afraid of loud noises and afraid to be left behind with a babysitter, when his parents leave the house for an evening out. He is afraid to get into the swimming pool and sometimes, his friends call him a scaredy-mouse! This fear factor is the problem in the story. A big enough problem in the world of a young child. So, what is the solution? Well, its a very unobtrusive one. In fact, I didn't quite expect anything like this, but on deeper reflection, I think its the most suitable one for the story. The solution does not come from the outside or the external as I like to think of it. It comes from within. In the form of a little voice inside the Little Mouse, which keeps assuring him and prodding him on to try new things and to overcome his fears. That's all it is. Just a little voice. This is what appealed to me the most in this book. One, because it resonates my belief that every person is equipped with the internal resources to come through in any situation. And two, because it gives me an opportunity to mould a vision of God out of the Voice within. What was interesting was that it did not take much effort on my part to do this. When I asked Winkie what he thought that voice could have been, he suggested this idea himself. So for this one precious precious thing, I loved this book. For something so big and seemingly complicated has been made so easy to present to the eyes of a child. What follows in the story is fairly typical. The Little Mouse learns to tune in to the voice within and becomes just a bit more daring. He now loves to splash in the swimming pool, doesn't mind trying out new food set on his dinner plate (wow!! ), cooperates nicely in the dentist's office and no longer minds the shadows in his room at night. And just when you think that's all there is to the story and are ready to call it a night, a whole new twist appears. The Little Mouse is now in a playground and all his friends are calling out to him from the slides and the swings and the wobbly bridge, asking him to join them. Now the Little Mouse used to be scared of all these things. Will the voice within him help him get over this too? Will you turn the page and see him swinging high and sliding swiftly with the other kids??? You won't. For he doesn't want to try out any of these things. He's happy enough to sit on the bouncing duck where he feels safe and happy. At first, I was very disappointed to see t.h.i.s end to such a grand flow of events. But after a while, my feelings settled and I understood that bravery lies not just in trying out new things and overcoming your fears...it also means knowing when you want to say NO and feeling okay about it. And setting this concept in the light of adult world situations made me appreciate this brand of bravery a lot better than I did at the start. Now, I don't know really if Winkie understood and appreciated the subtle nuances of this turnaround. And I don't know if it sent out any mixed signals to him. 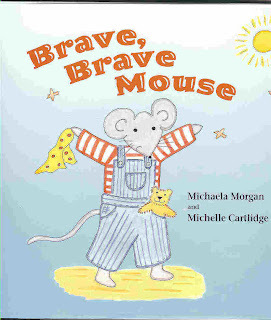 What I do know is that whenever we have faced any situations thereafter, where he is hesitant to put a foot forward, we remember and remind him of the story of the Brave Brave Mouse and the little voice he heeded! This a great pick, as I can relate to it well. Sooraj is quite similar to Akil in his temperament. (Actually many a time when you write about Akil in your blog, I keep thinking that he and Sooraj are similar in so many ways !!). I notice that such books do make an impact on him even if it is not obvious immediately. A customary amusement from France. Before endeavoring this amusement work on strolling heel to toe so as to the music as the developments request an abnormal state of physical control. You require a lot of room and a protected surface on which to fall toward the finish of the melody. Help kids to be chivalrous to remember each other as they tumble.